Joy Creek Photo Archive (c) all rights reserved A mat forming shrublet with trailing stems of aromatic mid-green foliage. 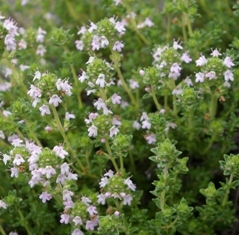 Thymus serpyllum 'Pink Chintz' blooms in terminal whorls in summer. Summer. 10 in. x 18 in.